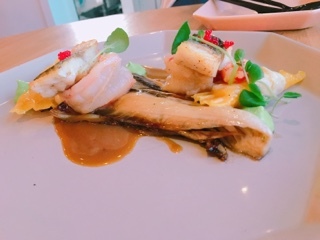 Doma offers an array of dishes they describe as "Korean with French inspiration or French with Korean influences". To keep things fresh, their menu changes monthly and only a few favourites from the previous month are carried forward. It’s a pretty democratic way to create a menu; as staff ask diners about their favourite dishes, the menu should be curated around the taste of customers. Most people partake in their tasting menu where for $65 a person you try everything. In reality, for the sake of fairness, it’s really your democratic duty to sample it all so you can give a well-informed opinion on your favourite dish. If you’re not up for the task, the prices per dish have also been included in this post. Within a short while of ordering, an amuse bouche is brought out. 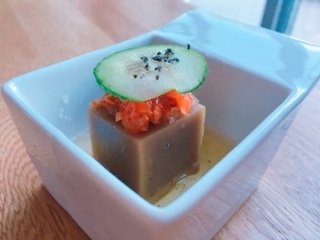 Being an acorn jelly, the actual jelly is neutral, so you’re greeted with a hit of spice from the finely diced kimchi and pickled onions with a slight saltiness added by the soy dashi. A refreshing summery start. 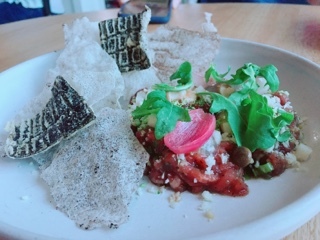 Meanwhile, the yook hwae ($18), a beef tartare that’s spiked with the spicy gochujang, is filled with flavours: of course there’s a bit of heat, but this is fairly delicate and balanced with sweet pear gel and pickled honey; black garlic aioli adds a lovely savoury creaminess. The long strips of beef, instead of the customary diced pieces, takes getting used to as it’s difficult to scoop the tartare and causes the entire pile of meat to come off in one bite. Hence, you’ll need the aid of a fork and it’s best to break the rice and seaweed chips into smaller pieces to create one-bite portions. Nonetheless, the tartare tastes good and I enjoy the little pieces of cauliflower and broccoli mixed in for crunch. The chips are also kept neutral so they add texture without competing on flavours. 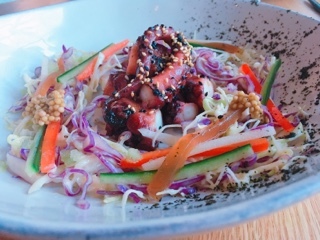 More than one staff member told us their grilled octopus ($20) is the sole dish that’s been on every menu since the start. In my opinion, this needs to be tweaked or retired. Sure, the slaw of cabbage, bell peppers, cucumber, pear jelly, and seaweed is good – it’s that mix of sweet, sour, and spicy flavours that’s synonymous with Korean flavours. Even the pickled grainy mustard on top really adds a pop to the salad. But then, the actual octopus, although meaty and tender is just SO sweet. If octopus can be rendered into a chewy candy, it’d resemble what Doma serves. 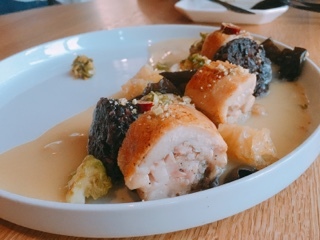 Instead, they should keep the sam gye tang ($24), a great rendition of the French chicken roulade where medallions of dark meat is stuffed, rolled, and then baked until the skin crisps up. The Asian flavours are brought in with the stuffing: a mix of ginseng, dates, and more meat. It’s tender and flavourful, and with a dollop of fragrant ginger and scallion paste even better. White and black fungus is added for crunch and also helps to soak up the oriental herb infused chicken veloute sauce in all its crevices. Of all the dishes, this was the greatest at amalgamating the French and Asian flavours in one plate. If Doma doesn’t keep the uhsun mandoo ($26) forever on their menu, I’ll be seriously mad. 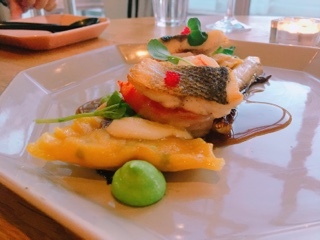 What a seafood lover’s delight with a piece of wonderfully cooked white fish (could be pickerel), a large sweet prawn, and the best part, a mandoo, which is a Korean dumpling filled with crab encapsulated in a ravioli pasta. Each of the individual proteins already have sufficient flavours, but then you smear on onion or pea puree and the ingredients change again. While the sweet potato rice cakes ($16) were good – a base of chewy Korean rice cakes filled with a creamy sweet potato puree - it could have been the dish that French flavours are featured more prominently. The European influence was in there with a light sprinkling of parmigian, but it didn’t really add much and everything else was more Korean focused. The tofu and pork belly ragout spooned onto the rice cakes is similar to the sweet bean paste sauce found in ja jang mein. 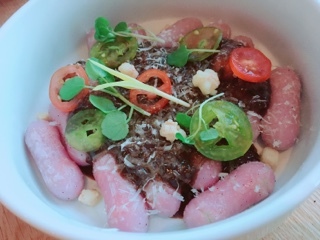 In lieu of the ragout, it would be interesting to pair the rice cakes with a creamy sauce or replace it with a thicker beef bourguignon instead. For being glazed in gochujang, I would have expected the pork belly ($26) to be spicier. Instead, it merely tastes sweet and savoury, especially with the grilled nectarines accompanying the dish. Overall, the flavour that was missing from Doma’s dishes is something spicy. 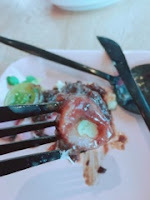 Indeed, there was a bit of it from the kimchi in the amuse bouche, but afterwards everything else was void of the taste that is so popular in Korean cuisine. The pork belly could have been the opportunity to showcase spice, even if it was merely incorporated into a side dish with the meat. 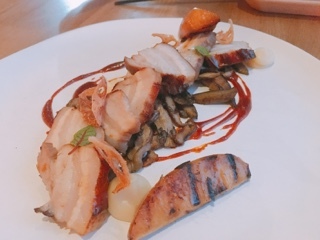 Nonetheless, I’m glad Doma invested in using a premium part of the pork belly where the meat and fat alternates in layers (rather than having one thick piece of each), it makes the pork belly less heavy and the flavours better-rounded. When it came to dessert, the Korean influence flew out the window. The first dessert, an ode to corn ($10) wasn’t even French and instead best described as North American. 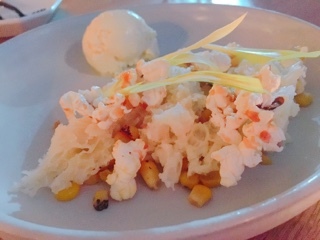 Sweet corn ice cream is combined with salted caramel popcorn, sponge cake, and corn kernels. The sweet and salty dessert was good and the honey truffle sponge cake an interesting pulled fluffy texture. Nonetheless, it was a bit disappointing that it had nothing to do with Doma’s vision. 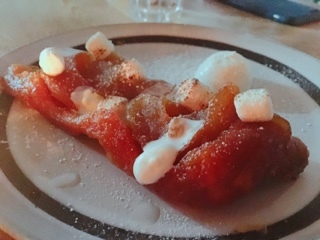 While the apple tarte tatin ($10) is definitely a nod in the French direction, it once again has no Korean influences (unless the country loves marshmallows). The dessert was just so sugary ... when there’s caramel sauce one doesn’t need marshmallows on top. Despite looking decent, it was just too sweet and even the fruit was overpowered. While Korean cuisine isn’t known for desserts, there are still some notable dishes. Chewy glutinous rice creations, similar to mocha, could have been filled with fruit and topped with Chantilly cream to make a Doma appropriate sweet. With so many renditions of red bean paste encapsulated desserts (whether it be pan fried, baked, or deep fried), surely something French could have been incorporated into the pastries to give it a fusion twist. Don’t get me wrong, with the exception of the octopus and apple tarte tatin, I was pleased with the taste of Doma’s August menu. If our waiter didn’t feel the need to explain that restaurant is known for French and Korean inspired creations, I could have just accepted the dishes as presented. But, if they really want to be known for marrying the two cultures, more dedication is required at ensuring every dish (not sure some) really showcase the spirit of each culture’s cuisine. Otherwise, it’d just be another mixed continental restaurant , which are a dime a dozen.